Red light therapy has been used for over 50 years to help naturally jump-start the tissue recovery process, increase blood flow and stimulate collagen production. Red light penetrates up to 10mm into the skin, having a positive impact on cellular energy, the nervous system and metabolic processes. 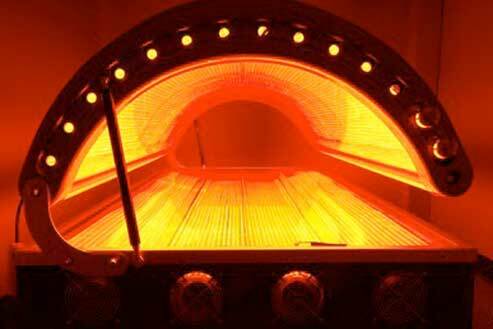 This IS NOT a tanning bed. The LED lights produce a wavelength outside of the skin-damaging UV range. LED red light therapy is FDA cleared for temporary relief of muscular and joint pain, promoting relaxation of muscle tissue, and temporary increase of local blood circulation. Collagen is a protein found in our bones, muscles, skin, blood vessels, digestive system, and tendons. It is the “glue” that holds our bodies together in our joints and tendons. Collagen reduces cellulite and stretch marks. As we age, our body’s production of collagen slows down. We begin to see wrinkles and sagging skin and joint pain due to decreased cartilage. A diet high in sugar, smoking, and unhealthy amount of exposure to the sun can also contribute to a decrease in collagen. How can I increase my collagen? You can increase your collagen by consuming foods rich in this protein like bone broth. You can also spend some time in a red light bed. Red light therapy has been known to significantly improve skin complexion, tone, texture and wrinkles.